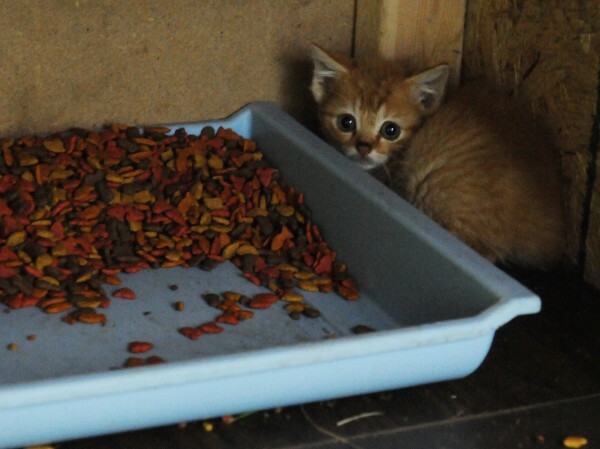 A feral kitten cowers in a makeshift feeding shelter set up near Hobson Avenue in Veazie in July 2012. The lower end of Hobson Avenue has numerous trailers, under which a large number of feral cats had taken refuge. A woman named Ruth plays with a cat she is about to adopt at the Animal Orphanage in Old Town in October. Ruth chose a cat that had been at the shelter since June. Feral cats are harder to place and require people with lots of patience to adopt them. FORT KENT, Maine — On their own, cats live well in the wild. So well, in fact, that feral feline colonies in Maine often experience fast, uncontrolled population growths. Some reports estimate there are anywhere from 11,000 to 30,000 homeless cats in Maine’s cities and countrysides. These sheer numbers can stretch animal rescue efforts and place immense predation stress on local wildlife. Even with private and public efforts to control the population, many felines still end up housed in one of Maine’s 90-plus licensed animal shelters. Once they arrive, not all have a happy ending. In 2012, more than 5,000 cats that couldn’t be adopted were euthanized, according to a shelter survey from the state’s animal welfare program. The previous year, more than 7,000 felines — an average of 14 each day — were put down. In total, about one of every five cats that enters a Maine shelter is euthanized. By comparison, shelter dogs in Maine are euthanized in both smaller numbers — only 644 in 2012 — and a much lesser rate — just 7 percent. One feline bright spot: 70 percent of shelter cats were adopted, compared to 61 percent of dogs. Yet once lost, cats are nearly never found. While 29 percent of stray dogs were reclaimed by their owners in 2012, only 3 percent of cats were reunited. The 2012 Maine shelter survey pegs the overall shelter population of cats that year at 11,462, but Lisnik said the real numbers are at least three times that. Ironically, it could be the good intentions of the people “rescuing” stray cats that dooms the animals to extended stays in shelter cages and likely euthanasia. Earlier this year, for example, there were sizable seizures of cats from homes. One in Freeport over the summer yielded more than 100, while one in Berwick in November yielded 38 and overwhelmed the local shelter. “The more we try to round up all the free roaming cats, the more we compete with nature,” according to Stacey Coventry, public relations manager at the Bangor Humane Society. Cats, Coventry said, are born survivors. But when a feral colony’s population starts to overwhelm its food supplies, female cats will produce fewer and smaller litters, thus exercising their own population control. According to The National Feral Cat Awareness Project, a fertile female cat can produce three litters a year, with an average of four kittens each. In theory, one female and her partner — provided their offspring survive and are fertile — can produce 42,409 cats over six years. Cats, Coventry said, will do what they need to survive and do so rather efficiently. To control feral cat colonies, various volunteer groups around the state, along with participating veterinarians, engage in “trap, neuter, release,” or TNR, programs. Eradicating feral cat colonies does not have widespread community support in Maine. Rather, Lisnik said, the practice of trapping feral cats, spaying or neutering and vaccinating them before releasing them back into their colonies has more appeal to Maine residents. “One of the problems with TNR is it is not a quick fix,” she added, citing an aggressive TNR program in Massachusetts which took 12 years to control the population. Since 2004, Spay Maine, a collaboration of the state’s animal shelters, veterinarians, animal control officers and animal welfare advocates have worked together to reduce Maine’s shelter intakes and euthanasia. This work is done in support of Help Fix ME, Maine’s low income spay neuter program, and by promoting spay neuter clinics and programs around the state. Since the group funded its first low-cost neuter in 2004, more than 18,000 animals have been fixed, according to Susan Hall, one of the driving forces behind the start of Spay Maine. One of the newer programs in Maine — Barn Buddies — matches feral or the less-socialized cats with people who have sturdy outbuildings in which the cats can live in dry, safe conditions. Durham resident and horse-facility owner Pam Ward is thrilled with her three new barn buddy cats delivered recently from the Coastal Humane Society. Ward makes sure her barn cats have access to food, water and shelter in addition to regular veterinary care. Dr. Christiana Yule of the Fort Kent Animal Hospital has spayed or neutered her share of northern Maine’s feral cats and generally supports the TNR approach. For those feral cats who do find their way into Maine shelters and who will never make cuddly, purring lap pets, there are options if people are willing to think outside the box. There is little doubt cats will continue to be a big part of the Maine landscape — indoors and out. As long as residents take the time and effort to protect these felines and take steps to ensure population and disease control, the future for Maine’s cats can be a bright one. After all, Maine ranks second in the nation for cat ownership with more than 50 percent of households counting a feline member of the family, according to the American Veterinary Association.